... and Whales, Seagulls, Sea Bass, Sardines and Mackerel too! 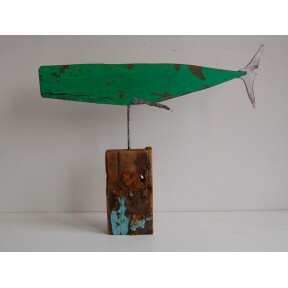 These unique artworks are made from up-cycled wood, hand painted wood, and interesting pieces of old fishing boats, which Andrew finds on the marsh and beaches. Each piece is individual, with its own character, and he can make something in a specific size or colour palette to suit your interior. The painted Crabs and Lobsters framed in the white clapboard boxed frames are very popular, and add an instant touch of coastal style to a room. 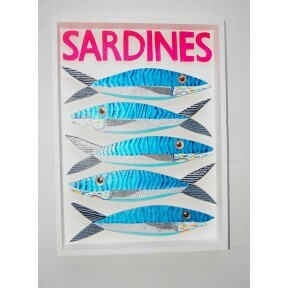 The fish vary in size from colourful tiddlers to very large Fish and Whales, which are good statement pieces. Cool fish made from upcycled pieces of boat, with an old rusting washer as an eye, and an etched metal fin. This is a unique and individual fish that would look great on your wall . 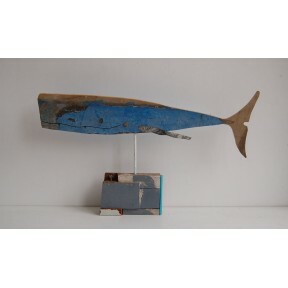 Measures 48 x 17 cms..
Beautiful blue whale set in wooden grey and cream block...all made from old pieces of boat. 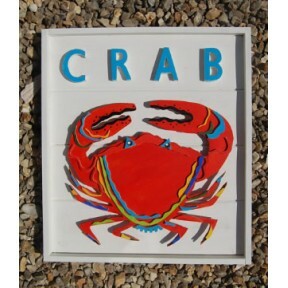 Measures 52 x 33 cms..
Crab made from upcycled painted plywood in a clapboard framed box with raised lettering. Measures 43 x 48 cms and 3 cms deep. Sorry ... 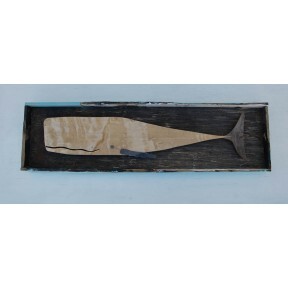 This is out of stock currently.. ring us for availability ..
Great fish made from really old pieces of boat, set in a box made of old marine plywood. Etched metal tail and a rusting old washer as an eye. A unique and individual piece. 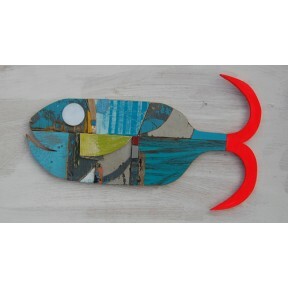 Measures 53 x 19 cms..
Funky fish made from pieces of old boat with a bright pink tail and a mirrored eye ! 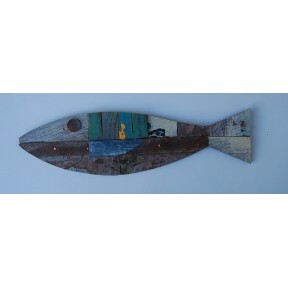 Measures 48 x 28 cms..
Fresh Fish Box. 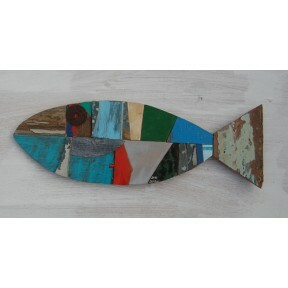 With fish made from old pieces of boat, and old marine plywood , with metal eye and etched metal fin. Set in a marine plywood box with framed edge. 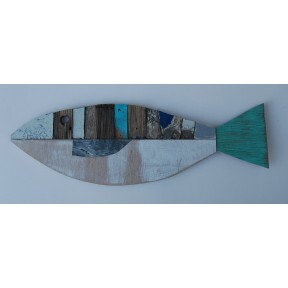 Measures 66 x 40 cms x 4 cms deep Price includes P&P..
Green and White Whale made from old pieces of fishing boat , set in an old block of wood with rivets, nails, and flecks of blue paint Measures 47 x 48 cms..
New painted Mackerel in white wooden box. 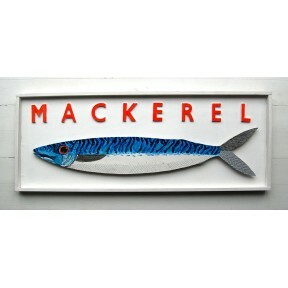 Mackerel has an etched metal fin ,and is painted on marine ply and mounted so that it stands 2 cms above back of box ;giving a nice three dimensional effect. The box has a frame around the edge which is 3 cms high. 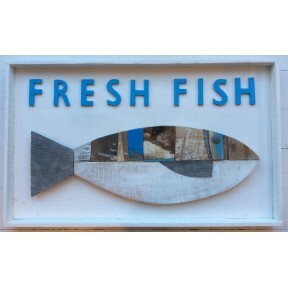 Lettering is again cut from marine ply and..
Made from old pieces of fishing boatMeasures 36 x 12.. 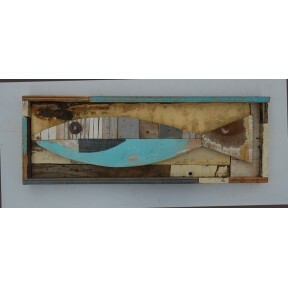 Fish made from old pieces of boatMeasures 32 x9 cms..
Sardine box with seven individually painted sardines, sitting in a marine plywood box with framed sides. 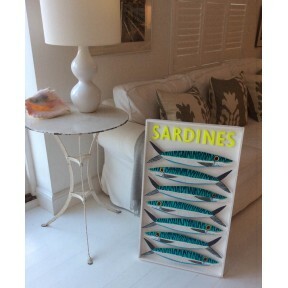 The sardines sit away from the surface of the box giving a great three dimensional effect, the lettering in neon yellow do the same. The sardines are all different ; have etched ..
Cheeky seagull made from painted marine plywood, set in a clapboard box, with lettering cut from marine plywood. 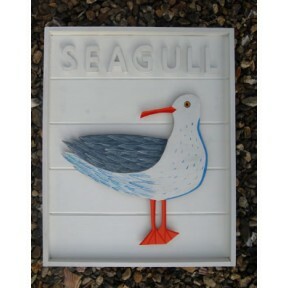 This artwork has white lettering ,but the seagull is also available with blue or orange lettering, so when ordering please state your preference ! Measures 43 x 59 cms ..
Beautiful white Whale set in a box with framed edge... all made from great pieces of boat. A really unique piece. Measures 70 x 20 cms..